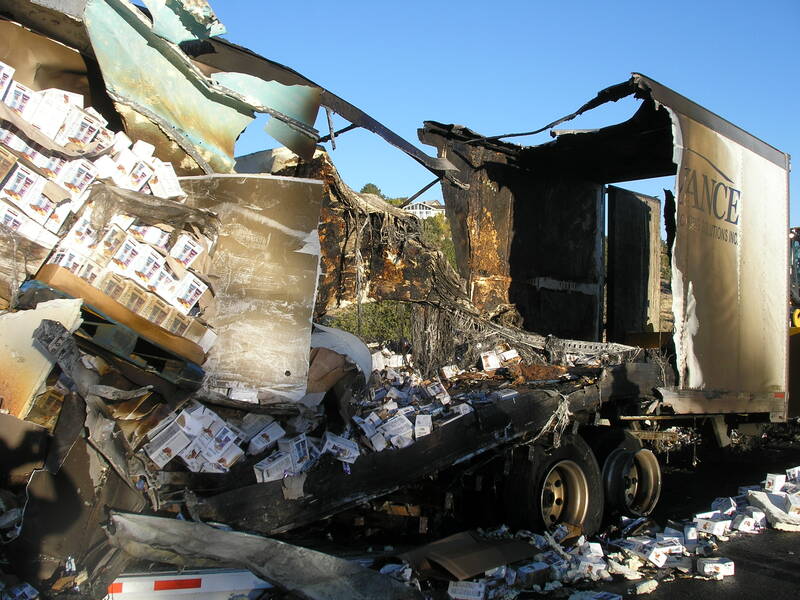 ST. GEORGE — A large batch of cookies was overcooked early Monday morning after the semitractor-trailer they were being hauled in caught fire on Interstate 15 in Cedar City. Emergency personnel responded to the single-vehicle fire on southbound Interstate 15 at mile marker 58 in Iron County at approximately 3:15 a.m. While firefighters were battling the blaze, the entire southbound side of freeway was shut down and traffic was re-routed through Cedar City, Utah Highway Patrol Sgt. Nick Street said. The semi’s trailer was loaded with cookies and protein bars, which spilled onto the road as the center portion of the trailer burned. No injuries were reported, and the cause of the fire is still under investigation, Street said. Traffic was reopened in the No. 1 lane at around 4:15 a.m. as responders went about cleaning up the scene. This report is based on preliminary information provided by law enforcement and other emergency responders and may not contain the full scope of findings.